As a non-profit Greyhound adoption organization, N.G.A. 's aim is to accommodate ex-racers, spay or neuter each individual, and integrate them into the surrounding communities. Dogs are welcomed into our kennel, and socialized with our volunteers and other Greyhounds as they relax and adjust into their retirement years. Pursuant to our mission, we work to educate the public and increase awareness of Greyhounds. Northern Greyhound Adoptions is a 501(c) non-profit charitable organization (DLN # 17053251706011, & EIN # 03-0367257) dedicated to taking care of retired racing Greyhound and finding them permanent, loving & responsible homes. N.G.A. is operated by volunteers and supported solely by donations. N.G.A. 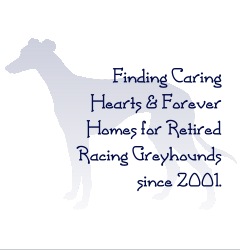 was founded by Donald and Dorothy Westover in October 2001 and places 50 to 60 retired Greyhound into homes each year. N.G.A. places dogs generally throughout the North-Eastern corner of the US, as well as across Canada! 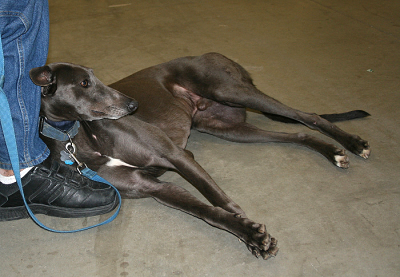 a pillow at an adoption event at the Champlain Valley Expo in April 2009.